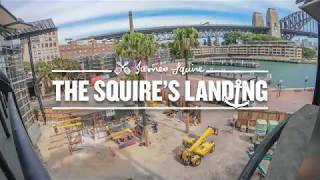 The Squire’s Landing is Australia’s newest James Squire Brewhouse and conveys the legend of James Squire. A convict on the First Fleet but perhaps more importantly, Australia’s first brewer. With 270 degree views of Sydney Harbour, The Squire’s Landing is the ideal spot for a night out, a special occasion or simply a relaxed get-together with friends. The menu is a collection of unique modern Australian flavours, woven together by inspiration from the legend himself. To ensure your night is one to remember, experienced and passionate staff will be happy to provide you with recommendations and suggestions when pairing beverages with your meal. The Squire’s Landing also offers four outstanding function spaces. These spaces all come with 270 degree views of the harbour, offering arguably some of the most beautiful views in Sydney.